A (Berry) Gay Valentine’s Day! Ah, Cupid! It’s that time of year, again, when everyone with a wife, husband, girlfriend, boyfriend, mistress, lover (or one or more of the above, or just those who are pining over another) sweat over the little things and every gesture assumes the importance of all that is good in the world – love, life, and chocolate. Rose purveyors and chocolatiers the world over count on Valentine’s Day to boost the bottom line and every dimly lit dining room fills to the rafters on February 14th – a boon this year since romance day falls on a Tuesday. We decided to celebrate early with these Saturday brunch blueberry pancakes. To gay it up, we used our heart shaped pancake molds (yes, we have heart shaped pancake molds in our equipment pantry!) and finished the pancakes with a deliciously tart raspberry ginger syrup. They were beautiful and tasty! America’s Test Kitchen inspired the pancake batter recipe. Fresh blueberries add a sweet, warm juiciness to each bite. The raspberry sauce is a bright alternative to traditional maple syrup. The leftovers will go into the freezer, ready for the toaster oven for this Tuesday’s quickie breakfast, before the rigors of work set in. Whisk the milk, yogurt, and orange zest in a medium bowl or large measuring cup; set aside while preparing the other ingredients. Whisk the flours, brown sugar, baking powder, baking soda, and salt in a medium bowl to combine. Whisk the egg and melted butter into the milk and yogurt until combined. Make a well in the center of the dry ingredients in the bowl; pour in the milk mixture and whisk very gently until just combined (a few lumps should remain). Do not over mix. Set aside to rest. Heat a 12-inch nonstick skillet over medium heat for 3 to 5 minutes; add 1-teaspoon oil and brush to coat the skillet bottom evenly. Pour a cup batter onto three spots on the skillet; sprinkle 1-tablespoon blueberries over each pancake. Cook the pancakes until large bubbles begin to appear, 1 to 2 minutes. Using a thin, wide spatula, flip the pancakes and cook until golden brown on both sides, 1 to 1 minutes longer. Serve immediately, and repeat with the remaining batter, using the remaining vegetable oil only if necessary. Note: If you are using heart shaped molds; spray the molds with non-stick cooking spray and place them on the skillet for 1-2 minutes to heat up before adding the pancake mix. Fill the molds about half full. Add about ½ tablespoon blueberries to the pancakes and gently press the blueberries to the center of the pancake. The blueberries may not be fully immersed in the batter. Cook in the molds for 2-4 minutes and gently remove the molds. Flip the pancake and repeat with the remaining batter. Remove any pancake stuck to the molds and spray with cooking spray after each use to avoid the pancakes from getting stuck. 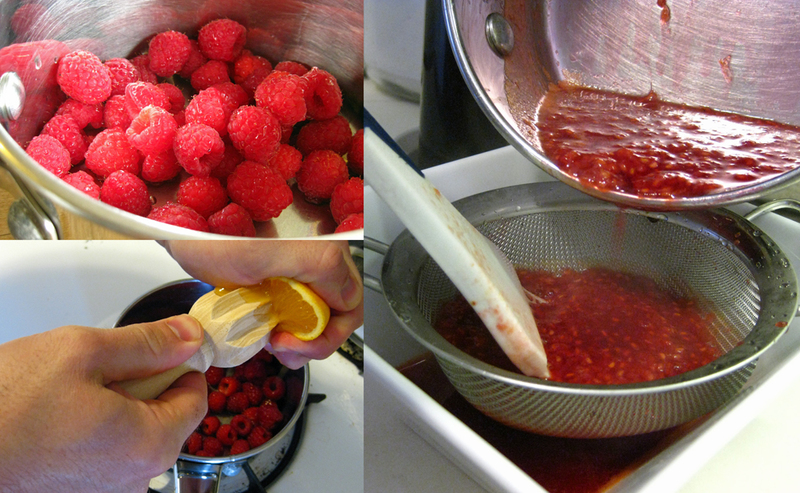 Add the raspberries, orange juice and ginger syrup to a small saucepan over medium heat. Smash the berries and cook for about five minutes. Put the syrup through a strainer to remove the seeds and place the strained syrup back on the stove. Cook until thickened.